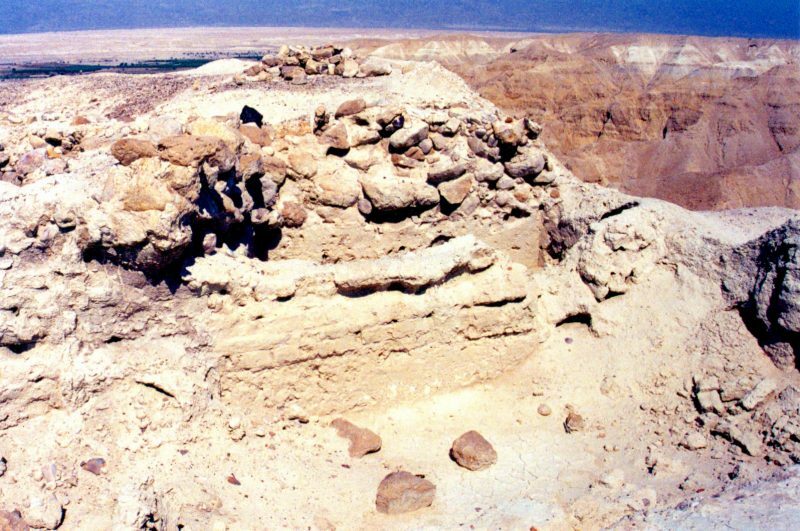 Did a superheated asteroid exploded in the sky above the Dead Sea 3700 years ago, obliterating the cities Sodom and Gomorrah, Admah, and Zeboim? Neighboring Zoar (Bela) was the only city to be spared. 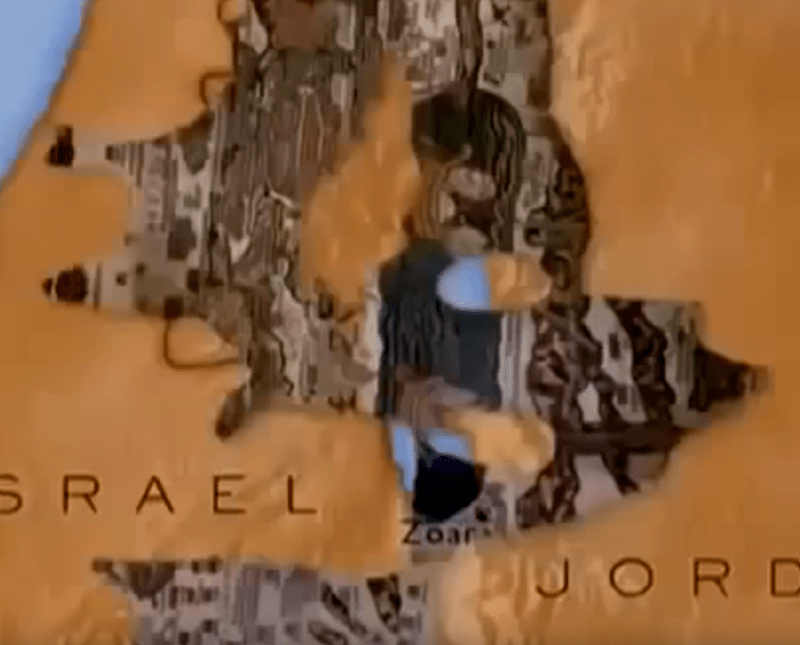 Of the five “cities of the plain”, only Bela, modern-day Zoara (Zoar), is securely identified. There are convincing arguments, but, in the final analysis, it really is speculation. Sodom and Gomorrah have been used historically and today as metaphors for vice and homosexuality. The strategic bombing attack during the last week of July 1943 during World War II, code named Operation Gomorrah, created one of the largest firestorms raised by the Royal Air Force and United States Army Air Forces in World War II, killing 42,600 civilians and wounding 37,000 in Hamburg and virtually destroying most of the city. 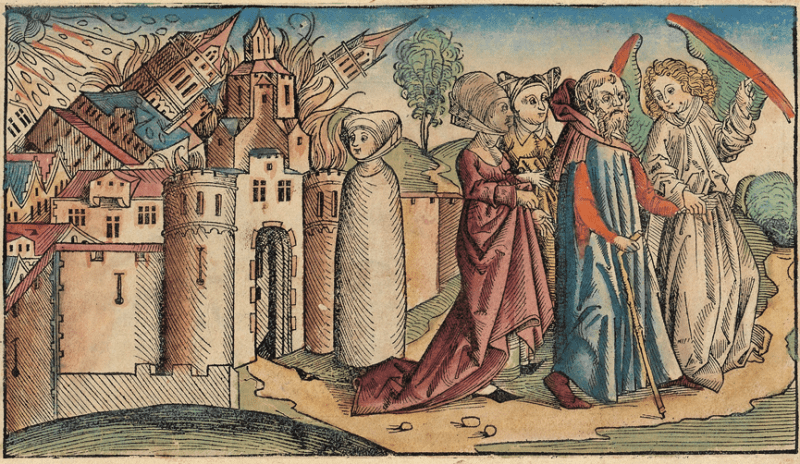 Sodom and Gomorrah from the Nuremberg Chronicle by Hartmann Schedel, 1493. Lot’s wife, already transformed into a salt pillar, is in the center. Was there a natural disaster? It is possible that the towns were destroyed by an earthquake, especially if they lay along a major fault such as the Jordan Rift Valley. There is a lack of contemporary accounts of seismic activity within the necessary timeframe, however, to corroborate this theory. The Tall el-Hammam Excavation Project (TeHEP) suspected a powerful meteor strike. However there is a lack of a crater. The researchers came up with a slightly different scenario: a meteoric airburst like one that took place 100 years ago in Tunguska, Russia. A meteoric airburst is a meteor exploding as it hits the thicker part of the atmosphere. The most powerful recorded air burst in the modern age is the 1908 Tunguska event. 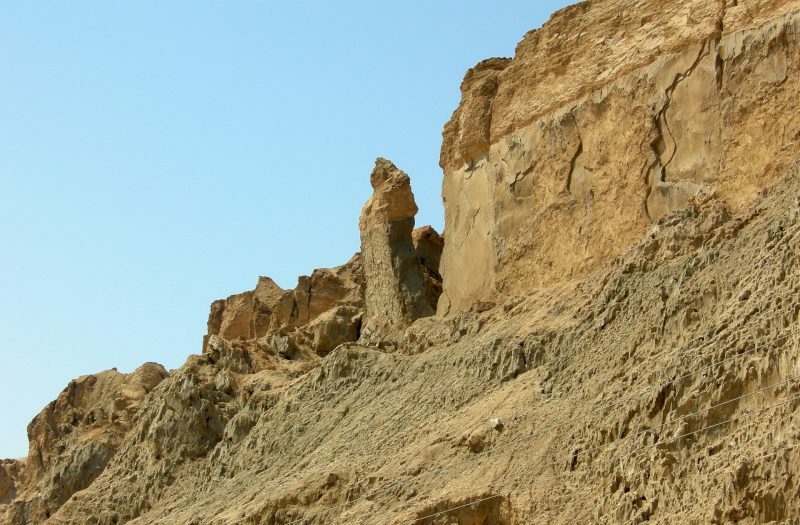 Mount Sodom: The limestone and salt hill at the south western tip of the Dead Sea, (הר סדום – جبل السدوم) ruins nearby as the site of biblical Sodom. Bab edh-Dhra (باب الذراع‎): Some biblical scholars argue that this was the site of “Sodom”. Other archaeologists disagree. Bâb edh-Dhrâ, near the southern Dead Sea, was destroyed by fire ca. 2350 BCE, but this was not appear to have been a significant fire. This site may not be Sodom because the village was too small (only 10 acres). Proponents of the Southern Sodom theory believe that the valley may have been hit by a small asteroid in 3123 BCE and that the air burst of this asteroid to be behind the downfall of both Bab edh-Dhra and Numeira. However, it is hard for these two towns to have been destroyed by an asteroid air burst in 3123 B.C. when they were not yet built and then lasted long after that date. Numeira: Near the southern Dead Sea. was destroyed by fire at ca. 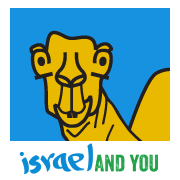 2600 BCE never to be re-occupied. It has been argued that Numeira approximates the alleged biblical city of Gomorrah. 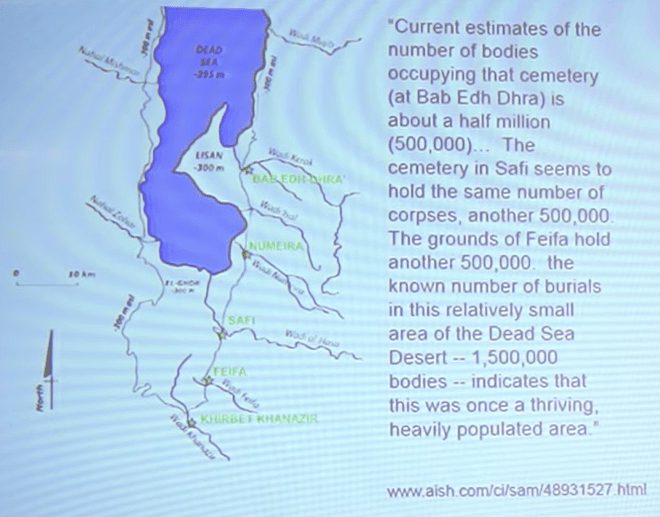 al-Safi, Feifa, and Khanazir: Sites were near the southern Dead Sea and showed evidence of burning and traces of sulfur. Tall el Hammam: This site is in the northern Dead Sea. Department of Antiquities of the Hashemite Kingdom of Jordan. The head of the Tall el-Hammam Excavation Project is Dr. Steven Collins; Dr. Gary A. Byers is Assistant Director; Dr. Carroll Kobs is Assistant Director; Dr. Phillip J. Silvia is a Field Archaeologist and Supervisor. The lower part of the valley, known in Arabic as the Ghor (غور), includes the Jordan River segment south of the Sea of Galilee which ends at the Dead Sea. Several degrees warmer than adjacent areas, its year-round agricultural climate, fertile soils and water supply have made the Ghor a key agricultural area. Tall el-Hammam is a archaeological site in Jordan on the north-eastern side of the Dead Sea. The site is around 36 hectares and was walled. Tall el-Hammam Excavation Project map near the Sowayma area of the Jordan River Valley. Steven Collins is an American archaeologist and a professor with the College of Archaeology at the unaccredited Trinity Southwest University in Albuquerque, New Mexico. Dr. Phillip J. Silvia is the Dean of Academics at the unaccredited Trinity Southwest University in Albuquerque, New Mexico. He is also a Field Archaeologist and Supervisor with the Tall el-Hammam Excavation Project (TeHEP) and author of “The 3.7kaBP Middle Ghor Event: Catastrophic Termination of a Bronze Age Civilization” during a session on Environmental Archaeology of the Ancient Near East. 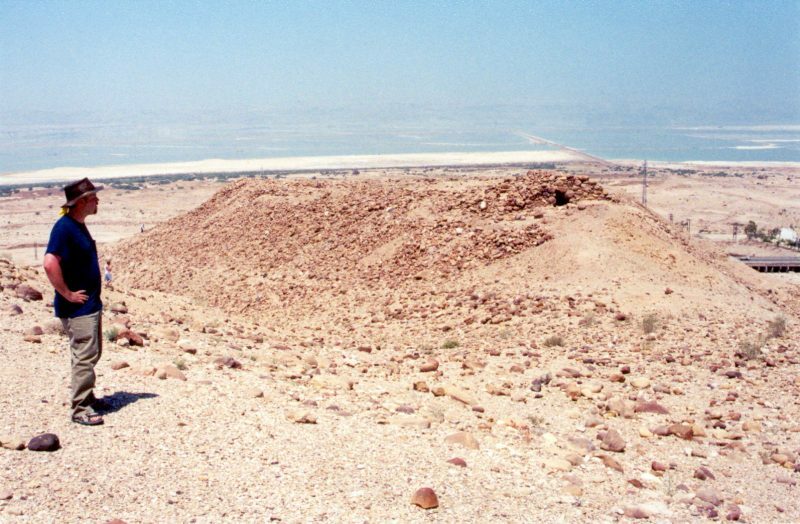 Trinity Southwest University archaeologist and biblical researcher Dr. Phillip J. Silvia says preliminary findings based on crystallised rock suggests a massive airburst meteor blasted a 25km wide circular plain on the northeastern edge of the Dead Sea, now called Middle Ghor. Five Middle Ghor sites on the Jordanian side of the Jordan River, showed the area was settled during the early Bronze Age, Middle Bronze Age, Iron Age for a stretch of at least 2500 years. Then, all of a sudden, the region suffered a collective collapse towards the end of the Bronze Age. According to Dr. Sivia’s abstract, the scientists discovered evidence of a “high-heat” explosive event north of the Dead Sea that instantaneously “devastated approximately 500 km2.” The explosion would have wiped out all civilization in the affected area, including Middle Bronze Age cities and towns. Silvia suggests that the blast would have instantly killed the estimated 40,000 to 65,000 people who inhabited Middle Ghor, a 25-kilometer-wide circular plain in Jordan. The proposal that Tall el-Hammam is Sodom fails on at least two counts, and these are helpfully summarized by two experts in their respective subjects. 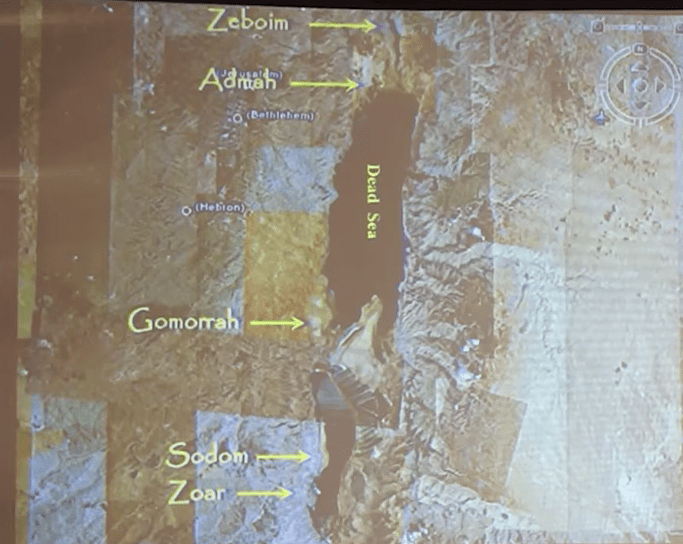 Geography Fail: Bill Schlegel, professor in Israel for 25 years and author of the Satellite Bible Atlas, explains why the biblical text does not fit the geography of Tall el-Hammam. Chronology Fail: Eugene Merrill, Distinguished Professor of Old Testament Studies at Dallas Theological Seminary and author of Kingdom of Priests: A History of Old Testament Israel, shows in a recent Artifax article that for Tall el-Hammam to be Sodom one must deny all of the biblical dates before the time of the judges.